Boyd is the Principal Researcher at Microsoft Research, Professor of Media, Culture and Communication at New York University, fellow at Harvard University’s Berkman Center for Internet and Society and co-author of Hanging Out, Messing Around and Geeking Out: Kids Living and Learning With New Media. Between 2005 and 2012, Boyd interviewed and observed teens from 18 states representing a broad cross-section of socioeconomic and ethnic communities, conducted 166 interviews and spoke to a variety of professionals who work with teens. 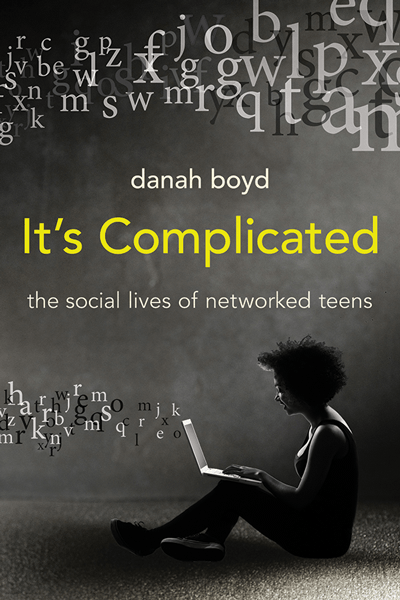 It’s Complicated highlights Boyd’s discoveries about teens’ online lives, and more importantly, her work debunks myths, misunderstandings and fears that the adult world holds about teens and their online lives. She introduces us to the term “networked publics,” referring to “…a space constructed through networked technologies and … the imagined community” that is a result of the convergence of people, technology and practice. Boyd wraps up her book with a conversation around literacy and firmly reminds us that we need to guide and coach youth in becoming media literate, which not only includes vetting information, but it also entails understanding how the web works, how networks function — web literacy. It’s Complicated is a must read for any educator, parent or professional who works with youth or shapes the lives of teens now and into the future. How about a faculty summer read?